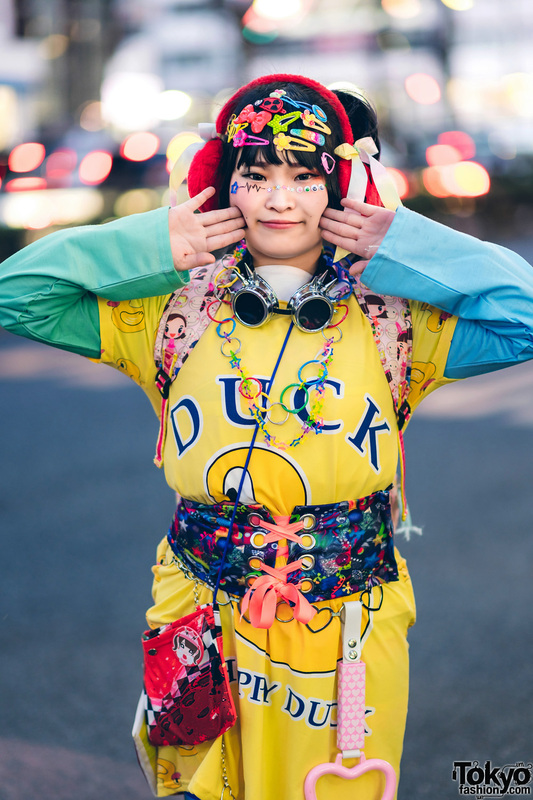 In Harajuku, we came across Lisa, a 19-year-old student and Purin-chan, the 18-year-old Pop Idol. 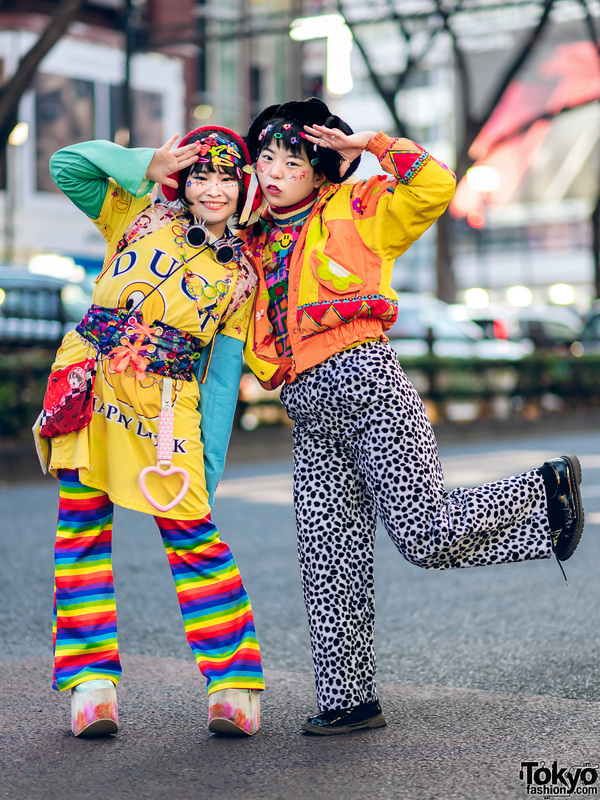 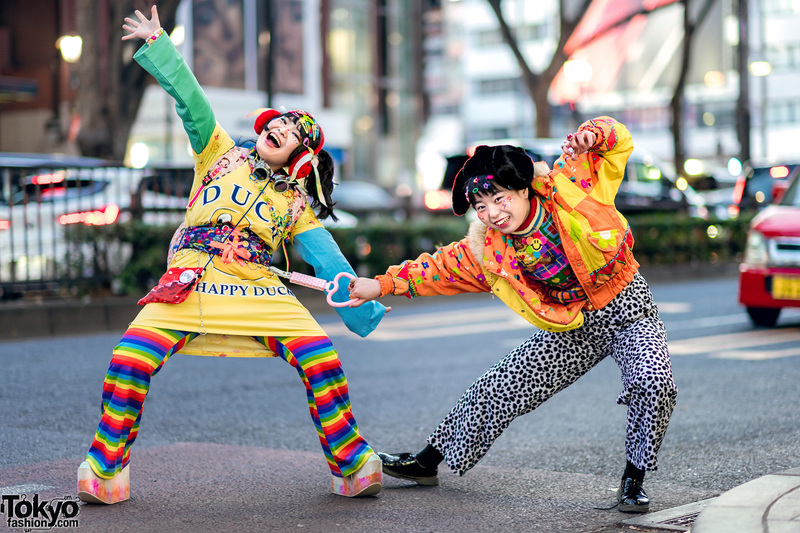 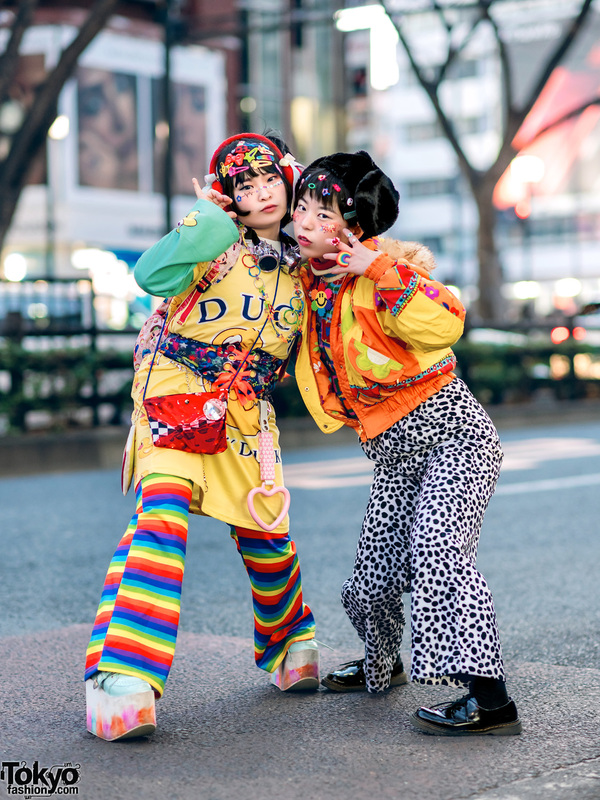 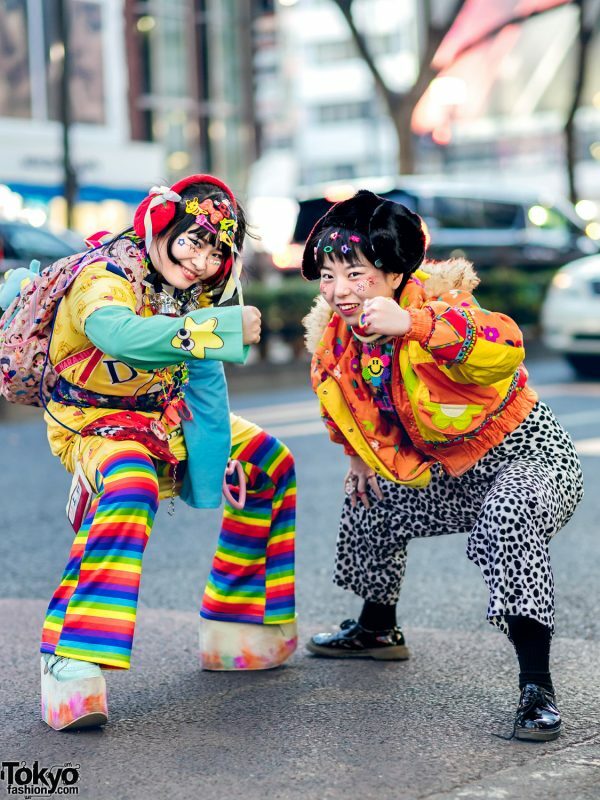 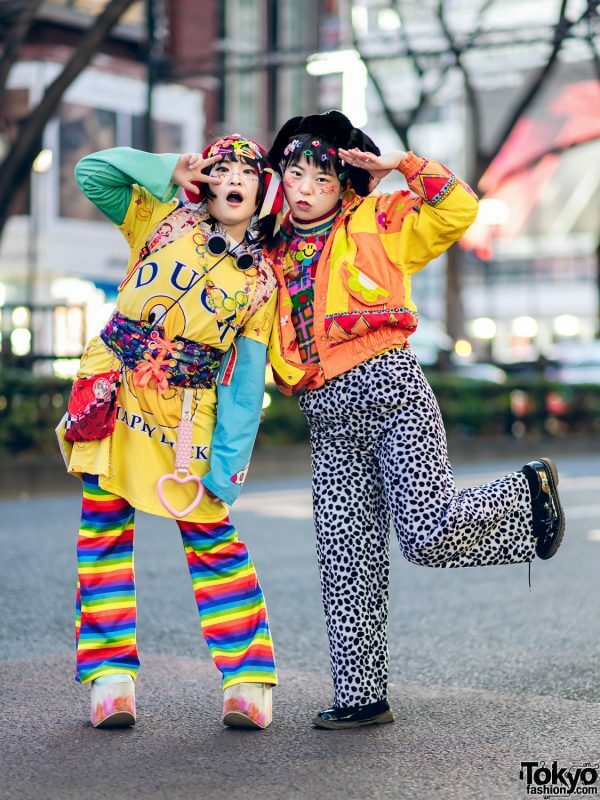 Both are wearing eye-catching kawaii streetwear styles that easily captured our attention. 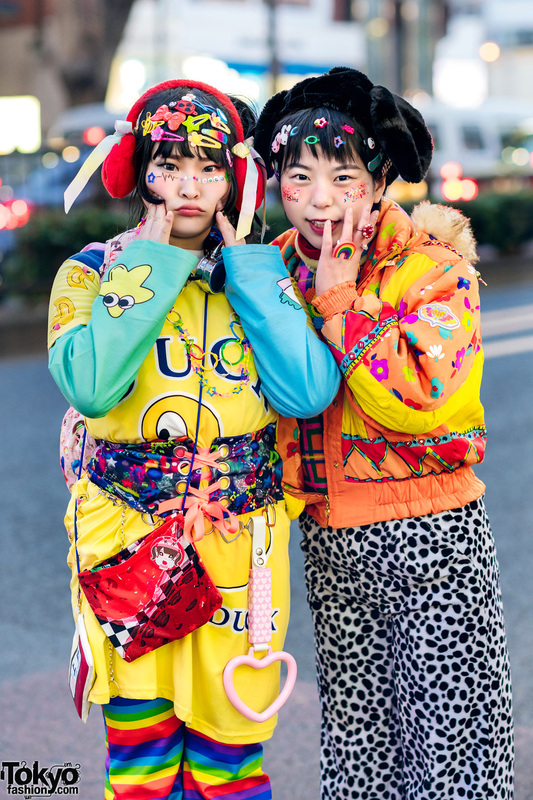 At the left we have Purin-chan, who is sporting red strawberry ear muffs. 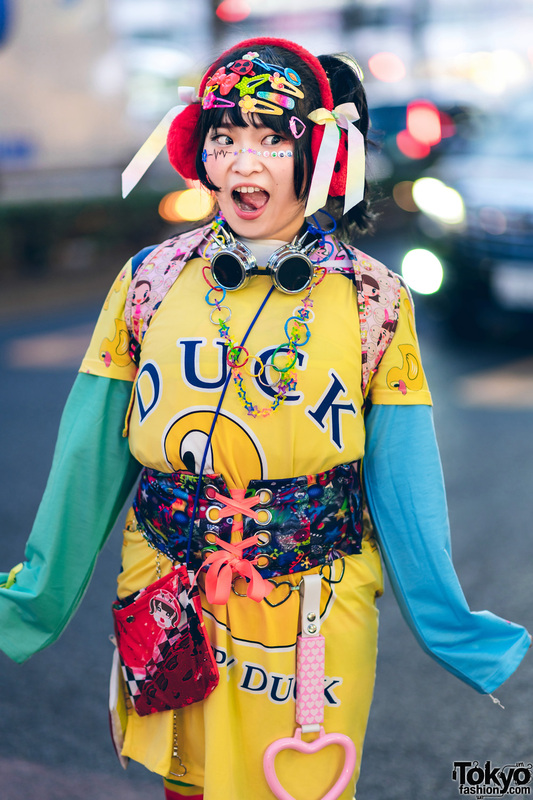 The Pop Idol is dressed in a yellow Happy Duck printed shirt dress from ACDC Rag, which she wore over a China-bought sweatshirt with aqua and blue sleeves. 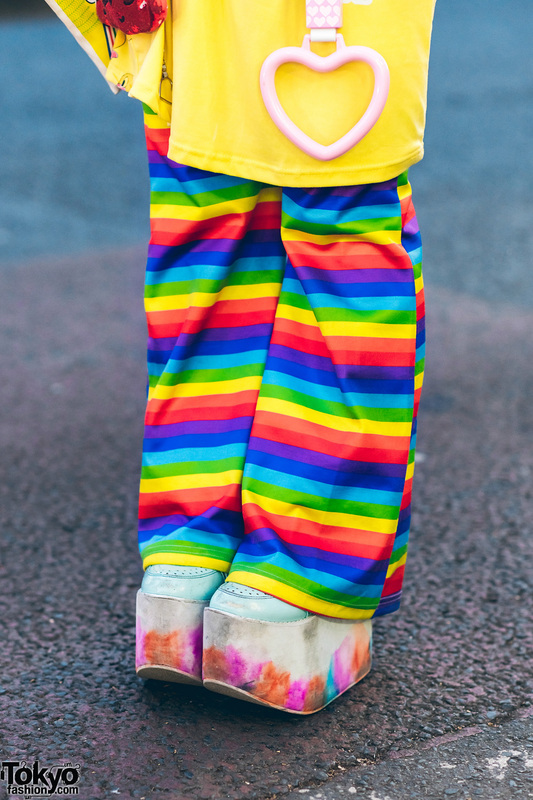 She cinched her layered tops with a printed lace-up corset belt, and donned rainbow striped pants from Kobinai. Purin-chan stepped into a pair of aqua platform creepers from Yosuke, and wore a pink backpack with cute face prints, also bought in China. 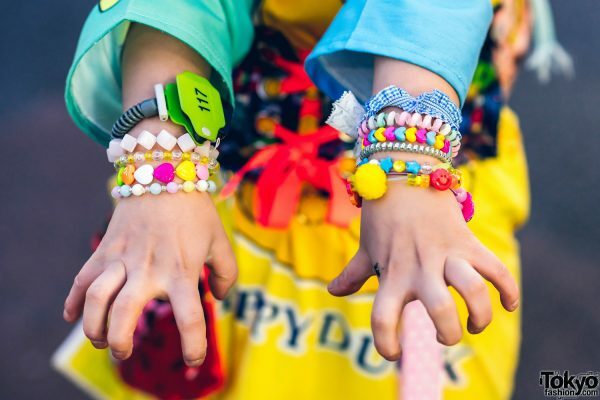 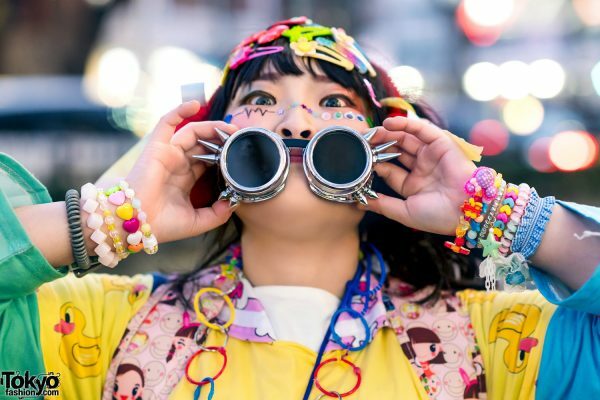 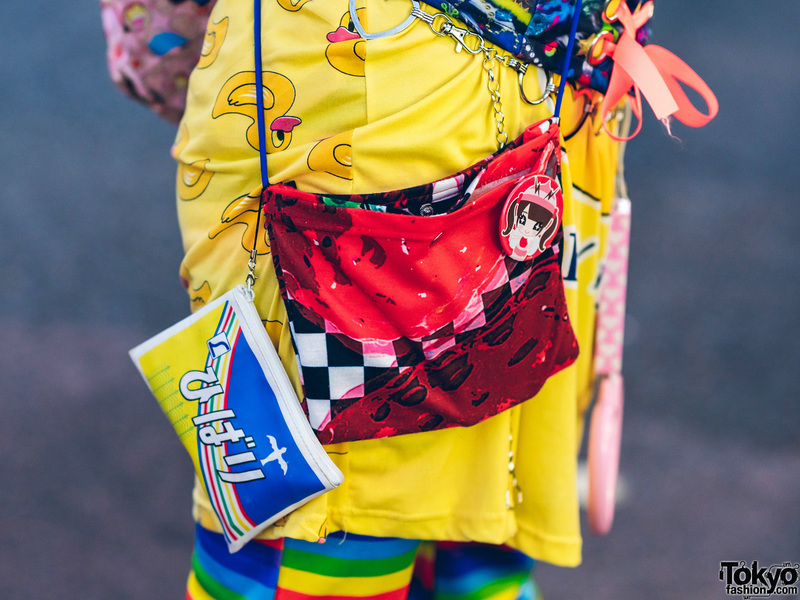 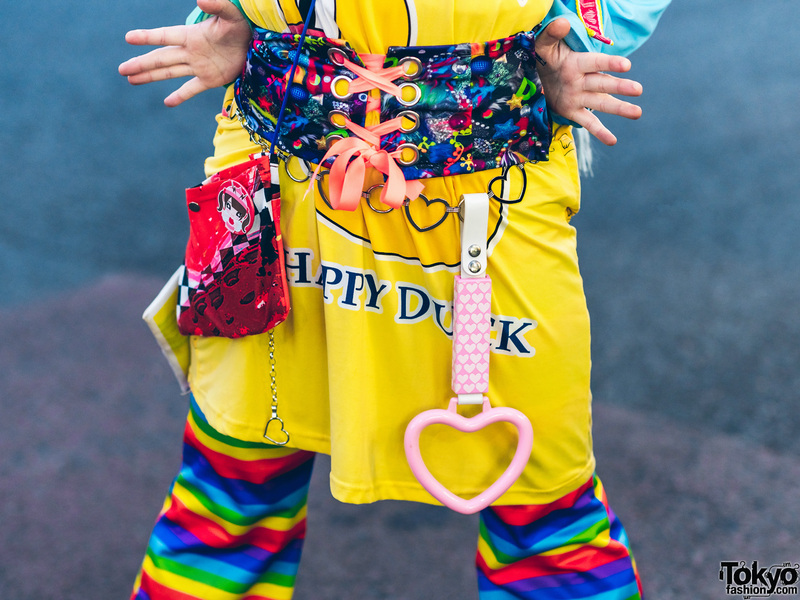 Her accessories consist of multiple decora hair clips, hair bows, spiked goggles, multi-colored o-ring and star necklaces, a silver heart chain belt, a pink printed sling bag, multiple keychains and multiple beaded bracelets. Some of her accessories are capsule toys, some are handmade, while some are from Nile Perch, 100-Yen Shop, Village Vanguard and ACDC Rag. 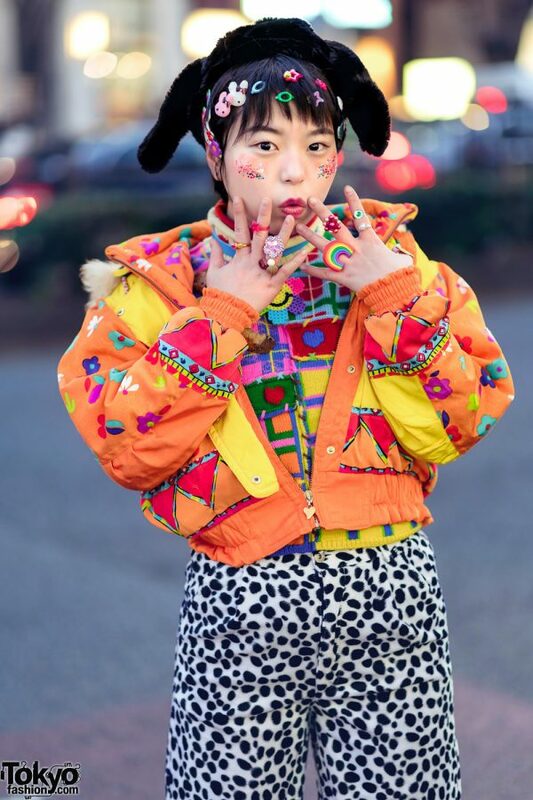 Purin-chan loves to shop at Galaxxxy, and she likes the music of Iz One and Twice. 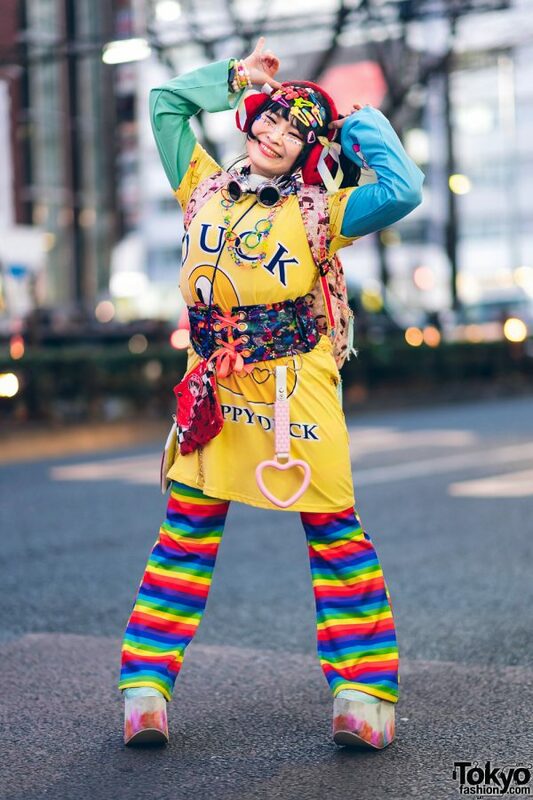 Follow Purin-chan on Instagram for more of her kawaii looks. 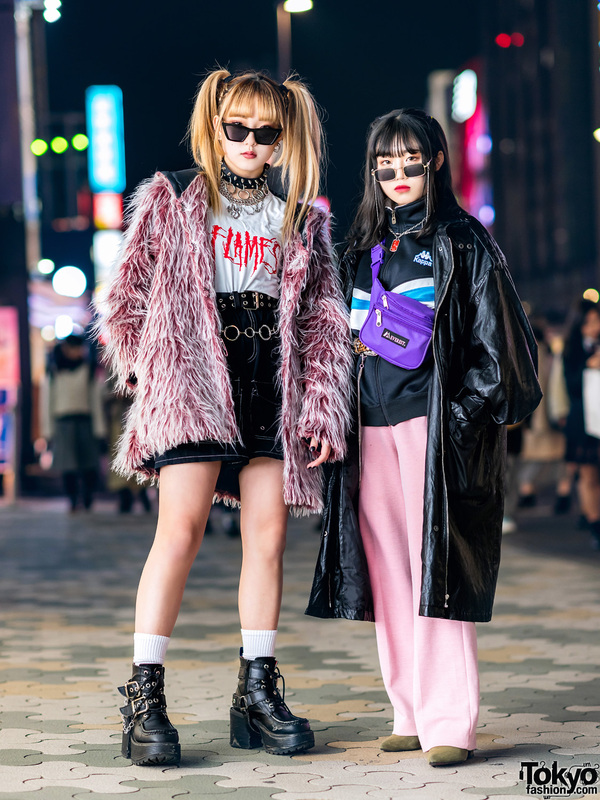 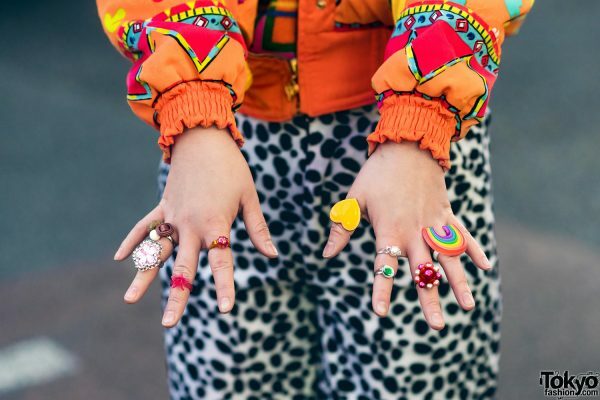 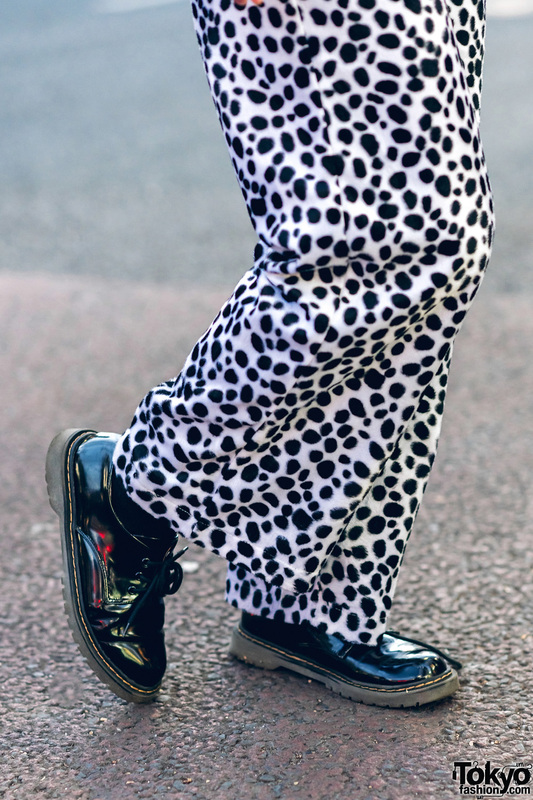 Meanwhile, Lisa’s kawaii outfit consists of a resale orange cropped bomber jacket with cute prints and furry hoodie, a resale multi-colored knit sweater with a mock-neck collar and accent stitches, and WEGO polka dot print wide leg pants. 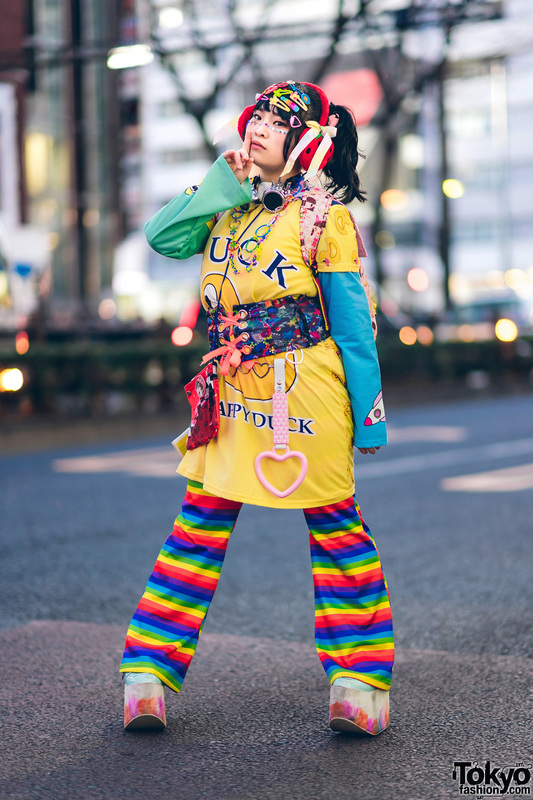 Black socks and Don Quixote lace-up leather shoes completed her outfit. 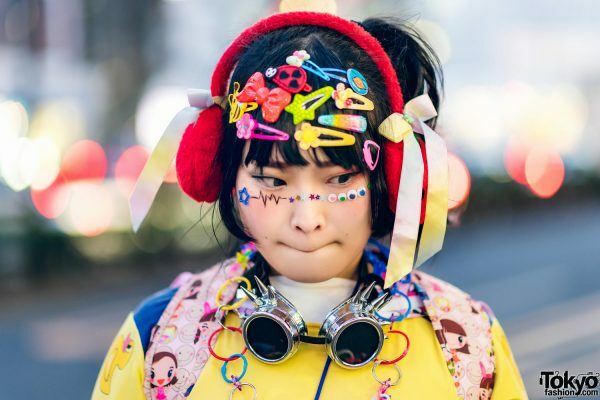 Her accessories – mostly from the 100-Yen Shop – include a black furry hat, decora hair clips, a perler bead necklace, and multiple cute rings. 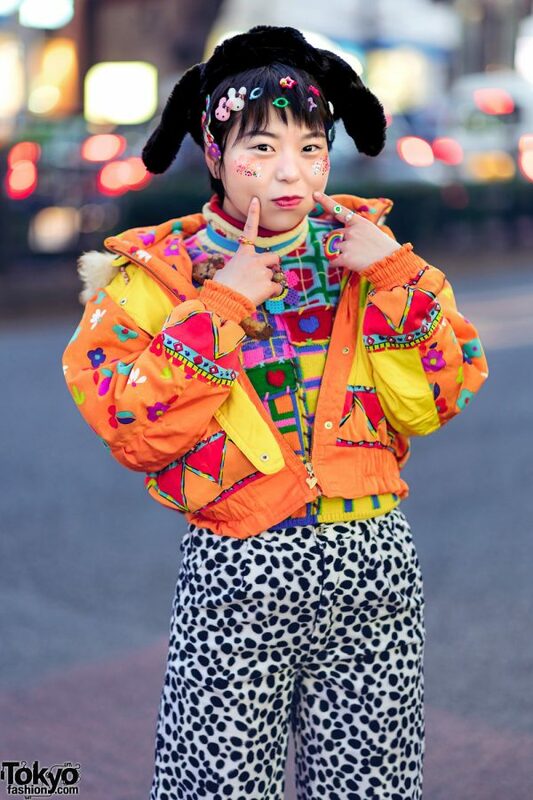 Lisa’s favorite fashion brand is Uniqlo, and she likes listening to the music of The Oral Cigarettes. 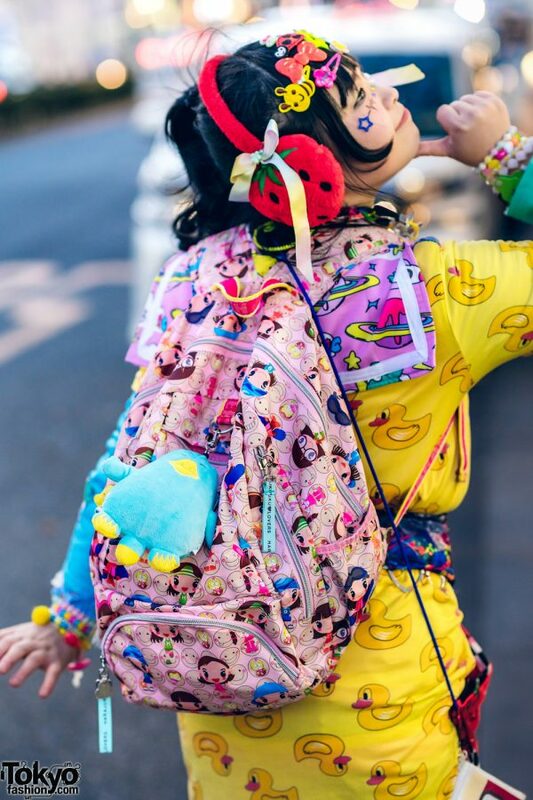 Follow Lisa on Twitter and Instagram.